We’re a Fairly Healthy Bunch, We Are! For more than 76 years the world has been blessed by those Expletive Amos Boys. In fact, Duane, being the octogenarian, now leads the pack into their next decade. I ask the boys what it’s like to live this long—longer than their parents—and to still be amazingly quite healthy. They feel very fortunate. Duane agrees. Even though he’s long been known for his love of sedentary reading, he’s done a lot of walking. He walked regularly for his job and later when he retired, he continued the regiment. Jerry’s secret is lots of exercise and a good diet. “That’s what Duane’s shooting for. A hundred, isn’t it?” asks Bruce. So here we have these three hardy guys who are always dissing each other about their age. And as each of us contemplates our own longevity, we thought it pertinent to pass along a family health history. It is, after all, just as important as our genealogical history. So here’s to that well-worn subject that we discuss as mundanely as the weather—here’s to our health. This week is National Arthritis Week so let’s start here. As we age, this nasty affliction sometimes stiffens our joints. The Amos folks are not immune. “I’ve had problems with my knees and shoulder joints and stuff like that, with arthritis,” says Bruce. “I haven’t been bothered by arthritis,” says Duane. “Very seldom. I just have trouble with my balance.” (Age has nothing to do with that one—anyone who knows Duane’s side of the family is well aware of our overall absence of grace and coordination). As Gladys aged, she too had problems with arthritis. It bothered her hands and her knuckles would swell. 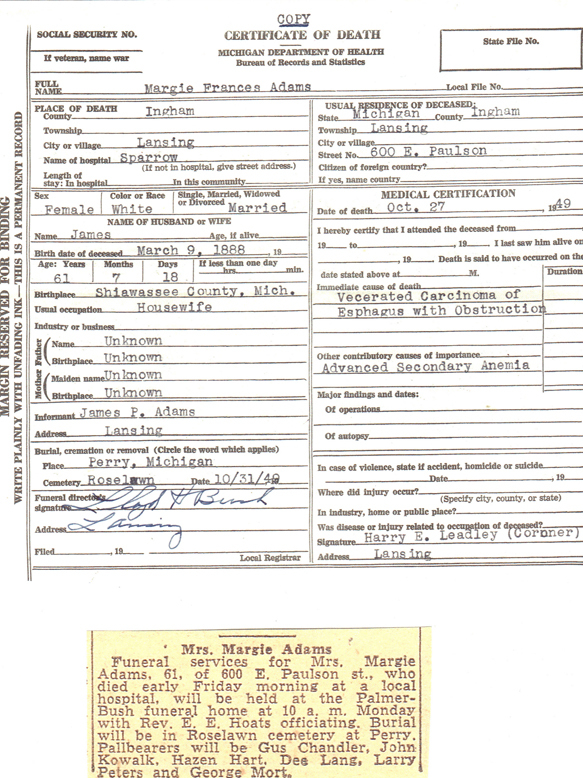 Maggie Laing Gulick Adams, also called Margie, was Gladys’ mother. Jerry lived with her for the first 12 years of his childhood. Maggie died of throat cancer. Unfortunately, our family has suffered with cancer. Included in our list is prostrate, breast, ovarian, throat and an aggressive brain tumor. But really, what family hasn’t dealt with this crummy disease? In generations past, many people who died of cancer were elderly. They didn’t have the preventative care and early detection we have today. “That’s what happens when you get old,” says Duane. There’s always this back and forth repartee between the guys. When I was a kid, cataracts surgery was something really old people had in order to improve upon their near-blindness. Not so nowadays. “Elaine and I have both had cataract surgery so we don’t need to wear glasses,” says Jerry. “I’ve had cataract surgery too, but I still wear glasses,” says Bruce. I wonder if cataracts are heredity or are they a fact of life if one lives long enough? All this eyeball talk makes me rather squeamish, but it is good to know someday I may not have to wear glasses. With all this health talk, I forgot to ask the guys about their childhood. Were they healthy kids, I wonder? One interesting story did come up. When Duane and Bruce were living in Indiana, their Grandma (Beatrice) Amos took them all the way to Chicago to get their tonsils out. Wow, what an adventure for two young boys!